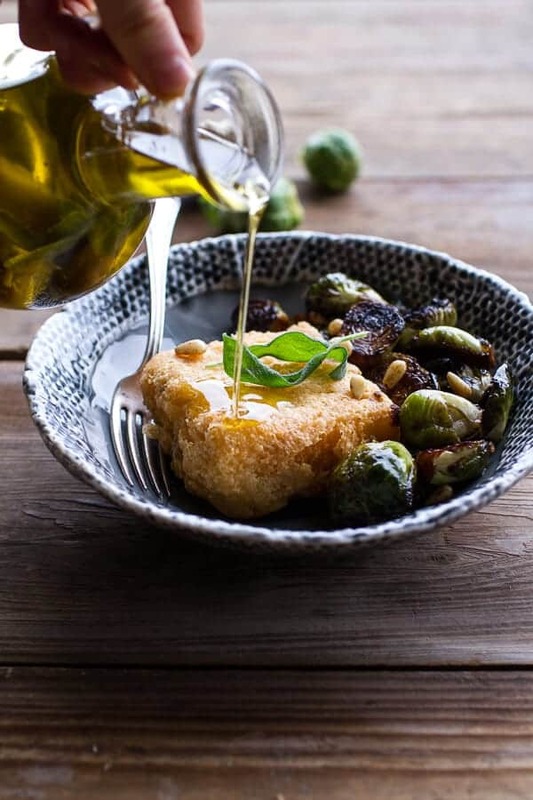 Cheesy Fried Polenta w/Pan Roasted Balsamic Brussels Sprouts + Roasted Garlic Sage Oil. So excited over this one. It’s the coziest of the coziest and I think I could eat it daily. I know that my mom could, and I think that on this one, I am right there with her. It may be simple, but I am not sure there is much that can beat fried polenta. Oops, I mean cheesy fried polenta. Some may not call this dinner, but I totally did. 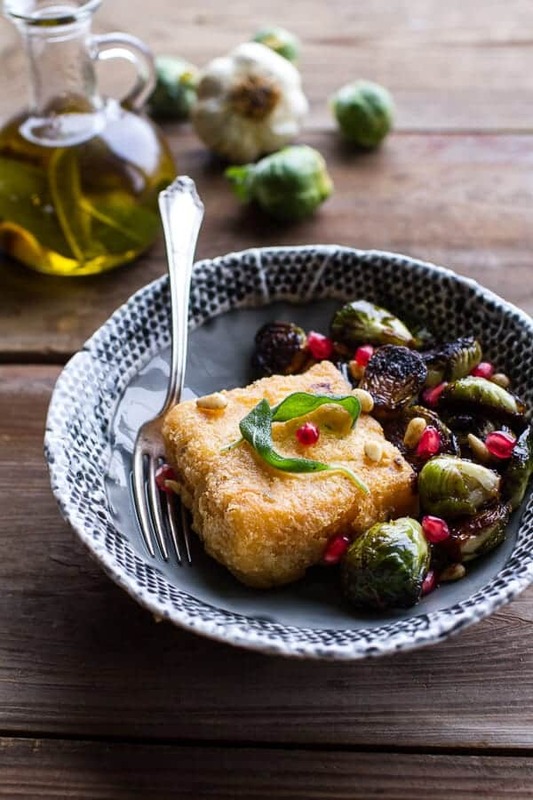 Some might say that a square of fried polenta and some brussels sprouts is not balanced, and to that I say – you are crazy! There is a little green, a little whole grain, and a little protein from all that cheese. Totally and completely balanced. Over the summer my mom sent me a pic of this dish she order from an eclectic restaurant, deep in the woods and slightly down the mountain in Mt. Hood, OR. It’s totally her kind of thing and I knew the second I saw the pic that it was probably her most favorite meal she’d had in weeks. She sent me this pic of fried polenta. At first I had no idea what is was and I replied back “while that looks boring”. So then she explained and I did a total 360 and said that looks delicious (because how could fried polenta not be?). But you guys, it literally was just a plate with a square of fried polenta and some saffron oil drizzled over top. At least I ‘m providing you with a little green (come on, you gotta admit this is better). Everyone except my dad (who loves brussels sprouts) would not eat the brussels sprouts and only ate the polenta, such wimps! 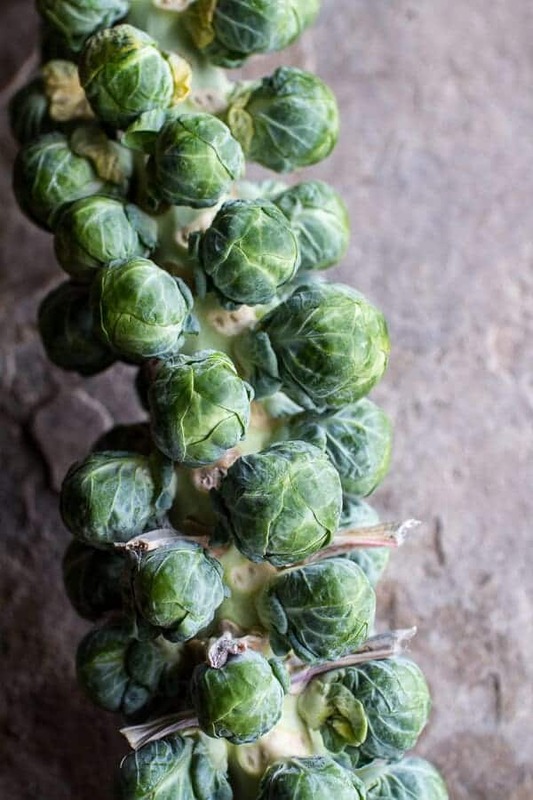 They are missing out – these are some of the most delicious brussels sprouts. I pan roasted them and added a balsamic-pomegranate glaze that makes them almost addicting, like you just want one after another. Or at least I did. I had said that I was going to wait a while to make some fried polenta because it seemed so un-summer like. So I did, and here we are today. It’s very cold, snowy (no joke) and the perfect time to make fried polenta. Gotta love autumn. It bring so much goodness. Here is the deal though, this is simple, but you have to be a little patient since the polenta has to firm up in the fridge for at least an hour. 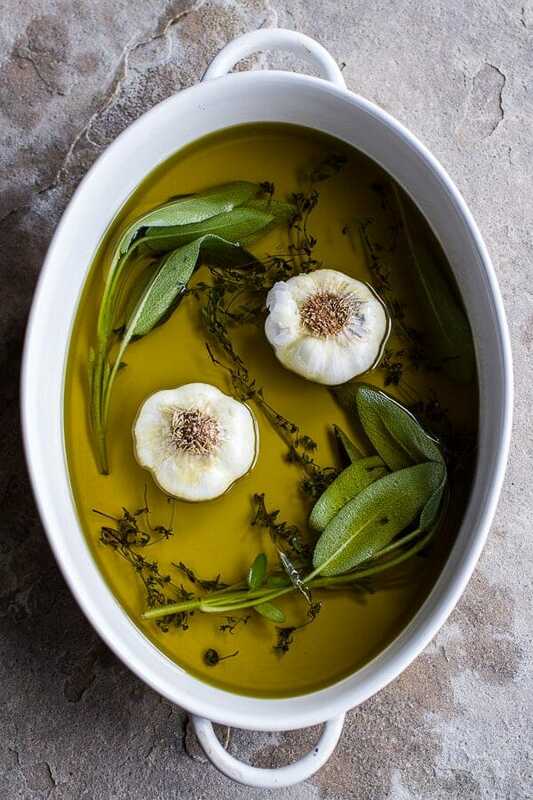 Don’t worry though, this gives you time to make the bestest roasted garlic olive oil (with sage and crushed red pepper too!). You can also make the balsamic pomegranate glaze for the brussels sprouts. The hour goes fast and then you are ready to fry. I added brie and blue cheese to my polenta, which I think was a pretty amazing combo, but any melty cheese will work fine. I gotta say though, brie is kind of amazing in this. It’s just so creamy and perfect. The blue cheese adds that nice sharp bite. So good guys. The cheesy part is kind of important, BUT if you happen to be vegan, you can still make this. Obviously, we loved the additions of butter and cheese over here, but for you vegan peeps, try swapping in vegan cheese, butter and or coconut oil. Or you can even leave the cheese out all together. Surprisingly, it is still pretty awesome. Also, may I highly recommend adding a fried egg? It kicks this dish up to a whole new level, and if you are wondering, I totally added one or two when I heated this back up for dinner. I always say, when in need of a finishing touch, add an egg. It never fails. Never. To make the polenta. Pour the water into a medium size saucepan and bring to a boil. Lower the heat to medium and slowly whisk in the polenta. Cook, stirring frequently, until the polenta is soft and thick, about 15 to 20 minutes. Stir in the brie, blue cheese or parmesan cheese, and butter, season with salt and pepper. Stir until the cheese is melted and the polenta is creamy and smooth. Grease an 8 or 9 inch square baking dish. Pour the hot polenta into the prepared pan and smooth the top with a rubber spatula. Let cool slightly, then cover and refrigerate until cold and set, at least 1 hour or up to 3 days. 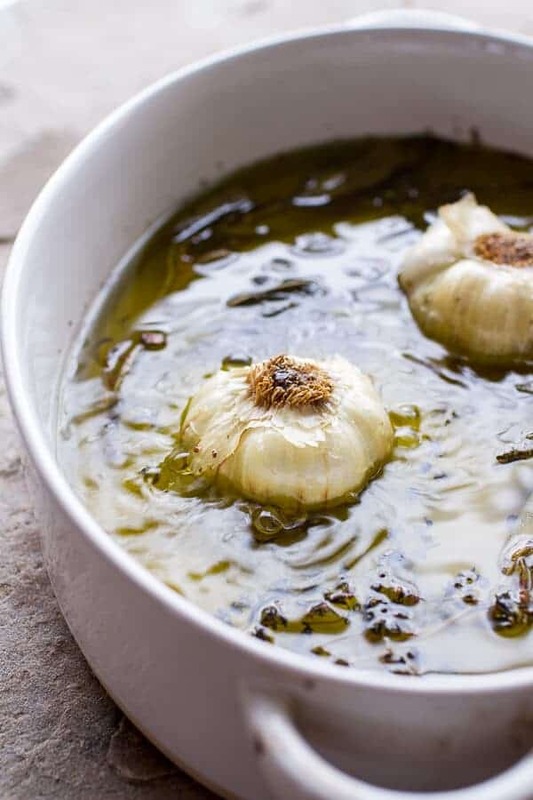 Meanwhile preheat the oven to 325 degrees F. To make the oil, slice the tops off the garlic and place the garlic cut side down in a 9x13 inch or slightly smaller baking dish. Pour the olive oil over the garlic. Add the sage, thyme and crushed red pepper. Cover the dish tightly with foil and bake for 45 minutes or until the garlic is caramelized and flavorful. Pour the oil through a fine mesh strainer. Store in a glass jar or glass container for up to 1 month. Save the roasted garlic for another cooking use (or uses!) and the sage for topping this dish. To make the brussels sprouts, heat a large skillet over medium heat, add the oil. Once hot add the brussels sprouts and cook, stirring occasionally, until sprouts are golden brown, 8 to 10 minutes. Add the pine nuts and cook 1 minute more. Season with salt and pepper, to taste. Reduce the heat and slowly pour in the balsamic vinegar, pomegranate juice and honey. Cook 2-3 minutes or until the balsamic glazes the brussels sprouts. 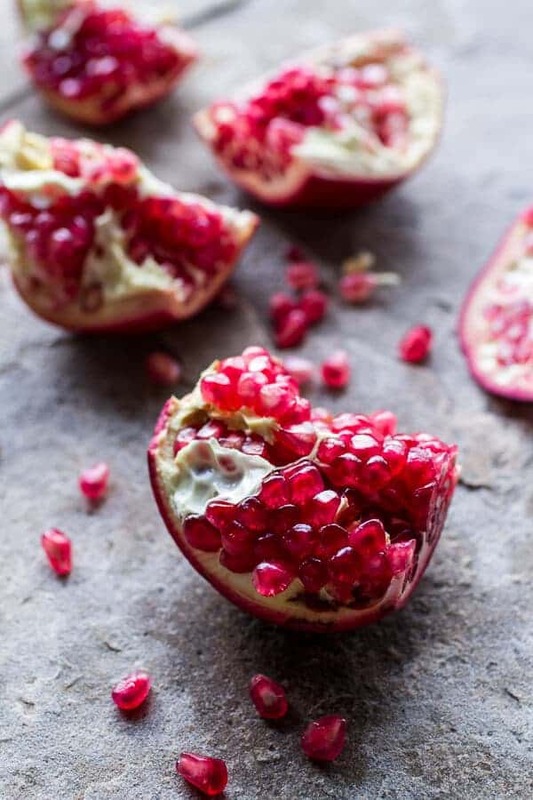 Add the pomegranate arils and cook another minute. Remove from the heat, but keep warm. 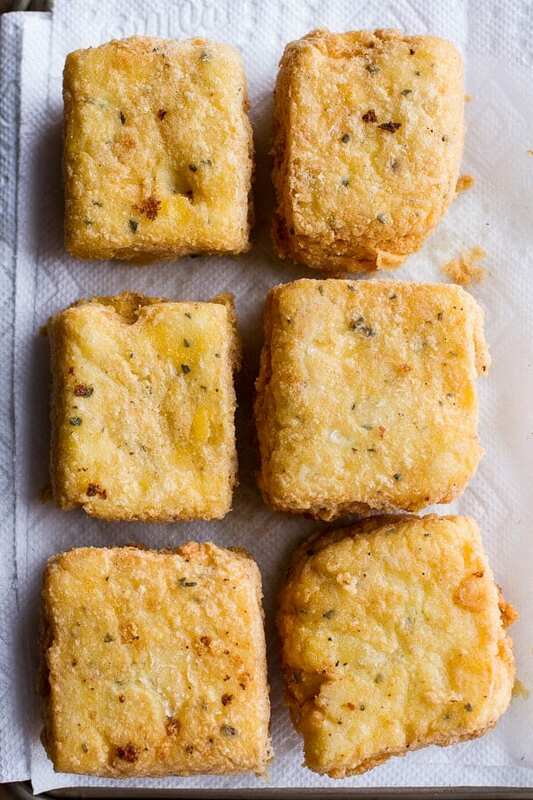 To fry the polenta, use a sharp knife and cut the polenta into 9 squares. Toss them gently with the flour, making sure all sides are coated in flour. Add the oil to a large pot and heat to 375 degree F. Add the polenta two at a time and fry, turning occasionally with a slotted spoon or tongs, until golden brown, 4 to 6 minutes. Transfer to paper towels to drain. To serve, divide the brussels sprouts among plates. Add a square of fried polenta. Top with sage, drizzle with roasted garlic oil. Eat immediately! *For a vegan friendly version, you can leave the cheese out completely or use your favorite vegan melting cheese. **To make this more of a balanced meal, I like to add a fried egg. Crispy on the outside. Creamy deliciousness on the inside. Just OMG. Mom’s Chicken Florentine with Creamy Roasted Garlic Polenta. 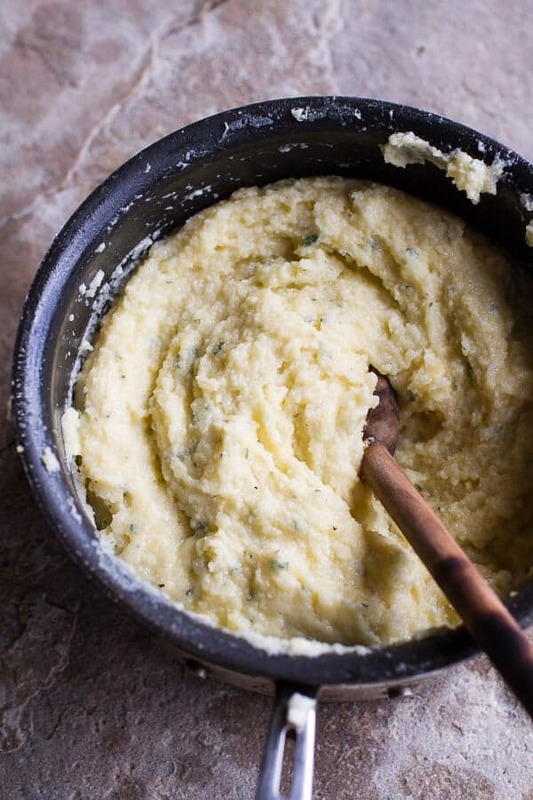 This is such a fun way to spruce up polenta! Hope you love it! That oil. Those sprouts. That polenta?!?! AWESOME! 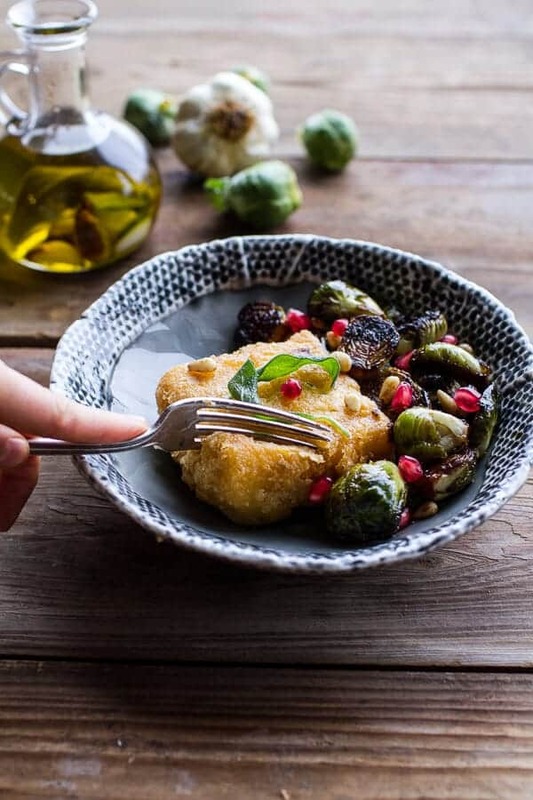 Tieghan, I’m not much on Brussel Sprouts but your pictures are amazing and I would give them another try after seeing this today. Oh I hope you do, I love brussels! Sometimes it takes a few times trying them to get to like them. 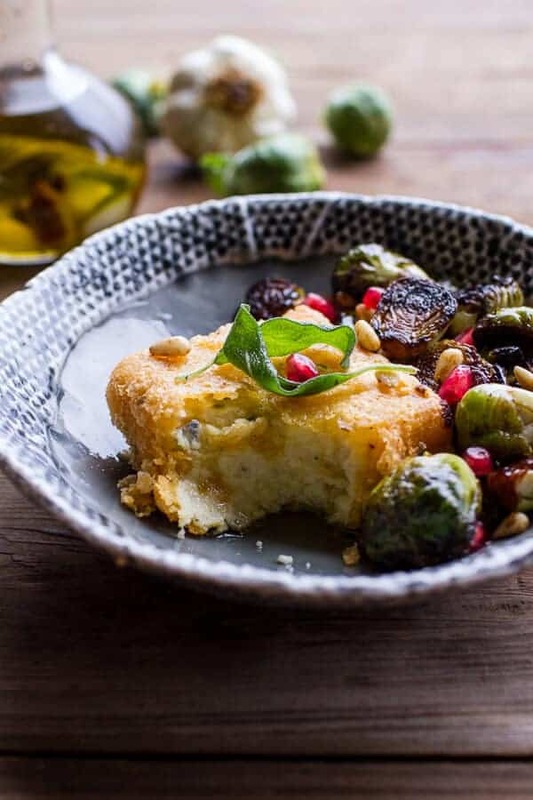 Im not sure which part to love more…the balsamic Brussels sprouts for the friend cheesy polenta?! Both would rock my world. They are perfect together, but the polenta rules! Haha! Thanks Meg and have a great weekend! This polenta looks amazing..I love how it looks so crunchy on the outside but the inside seems to be creamy…luv it. Roasted brussel sprouts are the best. It is so creamy inside. Love it! Well, this is insane! I have always love polenta, but up till now never even thought of frying it! Genius. Oh, and your photos are incredible… as per usual 🙂 Awesome job!! Thank you so much!! Frying polenta is a whole new kind awesome! 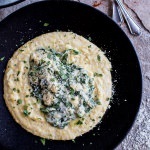 Oh my word – that polenta! I will be making this very soon Tieghan! This looks amazing. I think brussels sprouts may be one of my favorite veggies ever but as far as the family being wimps, I am totally there with you. They think that I’m crazy for liking them. And who says this can’t count as dinner? If I could get anyone in my family to eat that much nutrition on one plate then I’d be doing good. Totally balanced. I love everything about this post! Thanks Tori! Have a great weekend! It looks great, but “literally jumping out of my skin” was a somewhat off-putting first line! I hope you mean figuratively. Thanks Gary and sorry you did not like my first line. Yes, it was just figuratively. Woah more amazingness, I cannot take it! Thanks Sohpia! Have a great weekend! I LOVE polenta fries. So crispy and perfect! I’m shocked to hear that most of your family doesn’t do brussels. Well, more for you then! This dish looks amazing! Haha, really? I thought brussels are an un-liked food? Thanks Liz! Hope you have a great Friday! I think I’d pick this over birthday cake. This looks so cheesy and delicious! Love that garlic oil and yes for brussel sprouts!! Thank you so much, Ami! Brussels are my favorite! YUM! This needs to be in my belly, like yesterday! 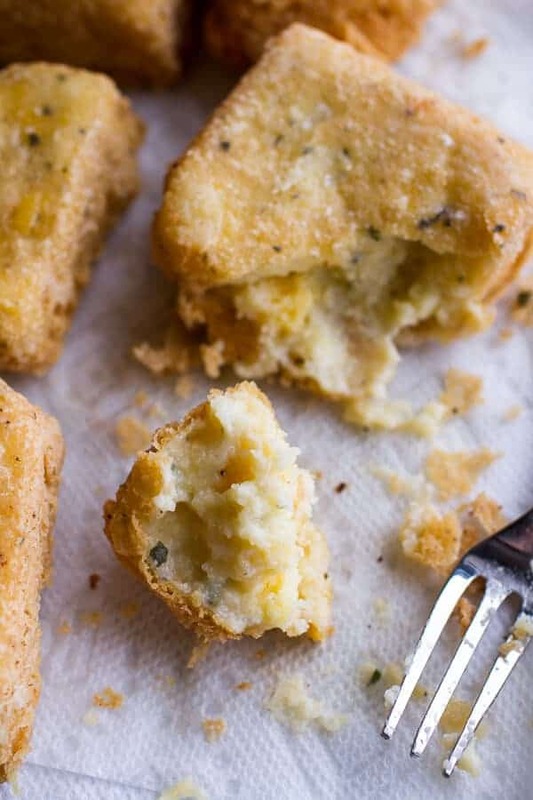 How incredible does that fried, creamy polenta look?! Sounds SO good! I say yes on it being dinner and yes on it being balanced and yes to the brussels sprouts and fried egg. 🙂 Pinning! Sounds perfect! haha! Thank you so much, Alexandra! 🙂 Wouldn’t that be awesome if things could magically appear?? 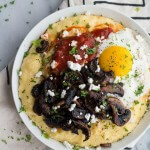 You know I am up for polenta and eggs anytime! Thanks Nancy and I hope you had a great day! I think it’s a perfectly balanced and over the top delicious meal! I love polenta, I could eat this every day! And your photos are stunning, I’m pinning the whole post :). Everything about this is awesome! You got me at ‘fried polenta’. And then I saw Garlic Sage oil?! And then I was excited about brussel sprouts, and that balsamic pomegranate goodness made it even better. So much yum! Thank you so much! Hope you have a great Friday! I am seriously impressed with this dish and how crispy you managed to get that polenta. Evey time I try to fry polenta is falls apart in the pan. Definitely going to be giving your recipe a go, hopefully i have some success! Really? Do you chill it in the fridge first? 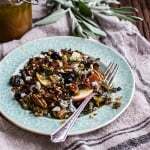 Thanks so much, Thalia and I hope you love this recipe! Oh my! I love polenta so this is a dish I would LOVE to try. Amazing! Oh my goodness! I’m not sure which part of this is my favorite! The flavored olive oil? The fried cheesy polenta? Or perhaps the glazed brussels sprouts??? This looks absolutely delicious! I’ve decided I’m going to make it for dinner tonight and can already taste how amazing it is. I love brussel sprouts! And who could go past fried CHEESY polenta?! 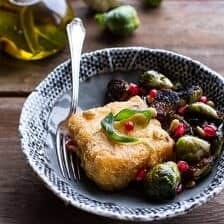 I absolutely adore polenta and for me it just has to be cheesy – anything else isn’t right 🙂 looks delicious – love how you pair it with Brussels sprouts! On step 6, how much oil do you need to fry the polenta? Do you mean the entire 4 cups of garlic sage oil, and deep fry? Hey Lori, do not use the garlic sage oil to fry the polenta. You want to use canola or vegetable oil. Fill the pot about 2-3 inches full with oil. Please let me know if you have anymore questions. Hope you love this! Thank you! I’m totally doing this with an egg for dinner this week, it looks amazing! Hope you love and ya for that egg! Wowzers, this looks good. Especially that oil drizzle!! Thanks Brandon! Hope you have a great weekend! These are a few of my favorite things! 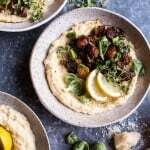 I adore Brussels sprouts and pairing them with this yummy polenta is genius. Adding a fried egg? Genius! THANK YOU! Have a great weekend, Candace! Oh my, these look absolutely gorgeous. I had a go at making polenta cakes in muffin pans once and they turned out fine, but just not quite crispy enough. These have given me the nudge to try again. I might try brushing with the oil and baking. I’ll let you know how they turn out. Incredible photos, awesome work. Thanks for sharing!